Russia and China veto UN resolution that would have imposed sanctions on Syria over chemical weapons. Russia and China on Tuesday vetoed a Western-backed UN resolution that would have imposed sanctions on Syria over chemical weapons, AFP reported. It was the seventh time that Russia, Syria's close ally, has used its veto power at the UN Security Council to block resolutions that single out the Damascus regime. China has backed Moscow by using its veto six times on Syria. The resolution, had it passes, would have blacklisted 11 Syrian military commanders and officials and would have also banned the sale or supply of helicopters to the Syrian government. The resolution was brought up after Human Rights Watch (HRW) said in a recently released major report that Syrian government forces had carried out at least eight chemical attacks in late 2016 as they were fighting to capture second city Aleppo. 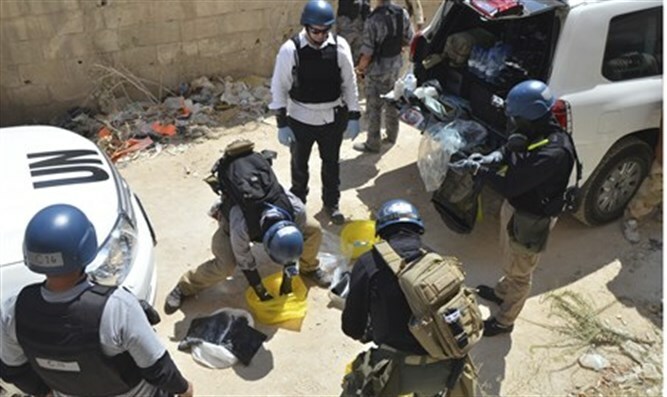 The report followed the discovery by a joint inquiry of the United Nations and the Organization for the Prohibition of Chemical Weapons (OPCW) that Syrian government forces were responsible for three chlorine gas attacks and that Islamic State (ISIS) jihadists had used mustard gas. Russian President Vladimir Putin warned ahead of the vote that imposing sanctions on Syria was "completely inappropriate" while talks were ongoing in Geneva on ending the war. U.S. Ambassador Nikki Haley fired back and said, "This resolution is very appropriate." "It is a sad day on the Security Council when members start making excuses for other member states killing their own people," she added. "The world is definitely a more dangerous place," Haley told the council after the measure was rejected. The resolution drafted by Britain, France and the United States won nine votes in favor, while three countries opposed it -- Bolivia, China and Russia. Egypt, Ethiopia and Kazakhstan abstained. UN resolutions require nine positive votes and no veto to be adopted. The vote marked the first major council action by the new Trump administration, which is seeking warmer ties with Russia. Russian Deputy Ambassador Vladimir Safronkov echoed Putin's view that imposing sanctions would have undermined peace talks and described the draft resolution as a "provocation" by the Western "troika". Chinese Ambassador Liu Jieyi argued that sanctions were premature and that the UN-OPCW panel should be allowed to complete its investigations. "At present, investigations are still ongoing and therefore it is too early to reach a final conclusion," Liu told the council, according to AFP.